"The cream cheese contributes to the excellence of this loaf." In another bowl combine flour, soda, baking powder, salt, cinnamon, cloves, and walnuts. Stir until thoroughly mixed. Pour all at once over batter. Stir just enough to moisten. Turn into greased 9x5x3 inch loaf pan. Bake at 350 degrees F (175 degrees C) for 60-70 minutes until inserted toothpick comes out clean. Cool 10 minutes in pan. Remove to rack to finish cooling. This bread got me great reviews at work. I served with a spread I whipped up using 3/4 c. margerine, 2 Tbsp honey, 1/2 tsp cinnimon and a dash of grated orange rind. It was gone in a half hour! This is the best pumpkin bread recipe I have ever used. So simple. The bread stayed moist, and would be perfect for gift giving. This was good, but I have a recipe that I prefer that is moister and spicier. very good pumpkin bread, cream cheese really does make it. it's also very heavy, which is how i think a pumpkin bread should be. fab! Everyone that has tasted this loaf, ask for the recipe!!! I made 3 loaves to feed some scouts at an eagle project, they devoured it. 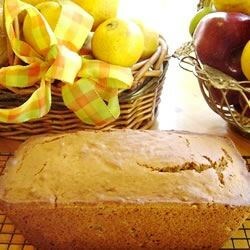 This is the best pumpkin bread recipe I have ever found.